Today I had the amazing opportunity to participate in something I had never heard of before. I was asked to be part of a living library, I was book #7. The event took place at Lucknow Central Elementary Public School in Lucknow Ontario about 1.5 hours away from where I live. It’s a great small community that has a mixture of farm folks and suburban peeps. My good friend Monica was my companion for the day and we had a nice drive. I love the fact that there is still so much green around, there were farms and not a lot of anything during the drive and it was really nice. I like getting out of the city as much as I can it’s just so pretty out in this world! The idea of a living library is to create a conversation amoungst a group of people so that we may learn more about the people around us in turn this promotes diversity and reduces prejudice. The living books are typically from all walks of life, from different cultural backgrounds, wide range of ages, and life experiences and vary in their careers. The way that ours was set up was that each “book” was at a table and table were located all over the school and groups of kids would come and “borrow” us. Before the even the kids were given a description of each “book” and asked to sign up to 8 out of 13 but they were only scheduled for 6 of us. Each period which lasted about 30 mins they came over and each of us “books” talked to them. I started with telling them a bit about me in the hopes that it would spear them to ask questions. Some students came ready with questions and some kids just winged it. The kids were great they were accepting and I sensed no hostility from them at all. At some points with was hard since most of the kids seemed really shy they didn’t have a lot of questions and in most of the 6 groups it turned out that I was engaging them and asking them questions. I tried to be informative about what it’s like being different asking them if they had been victims of bullying or seen it happen and all had either been or seen it. I’m not sure how I was received but I’m sure i will hear both positive and negative (if any) feedback in the coming days. I had sometimes to remember my audience since I am not around young adults everyday I treat them the same as I would my peers and had to remember to keep my filter in place so that I didn’t say anything that they probably shouldn’t hear. I can be negative sometimes and I’m glad I had Monica there who was an amazing help to keep me on track bring up things that were good ideas of things to talk about but also to talk to the kids about herself as well. The other “books” were a wide range of people there was a nurse, a DJ, a recovering alcoholic and drug addict (who is 9 years sober), Automotive repairman, Salon owner, a mother of an adult with developmental disability, Funeral director, owner of an auto wreckers company, Fitness instructor, a pharmacist, and an openly gay man. I got to meet some of them which was great. Monica and I asked the kids if they thought the experience was valuable or if it was another one of those school activities that we all dreaded in school but they were really receptive of the experience. They really enjoyed getting to meet different people who had a story to share they said that since they live in such a small town they don’t get exposed to as much diversity they don’t get to see what the world is like beyond their town. For lunch there was homemade lasagna, salad, fresh baked bread (still warm, yummy), and homemade brownies for dessert which were fantastic!! A great day had by all I would say! On my way out the door I got this as a gift. 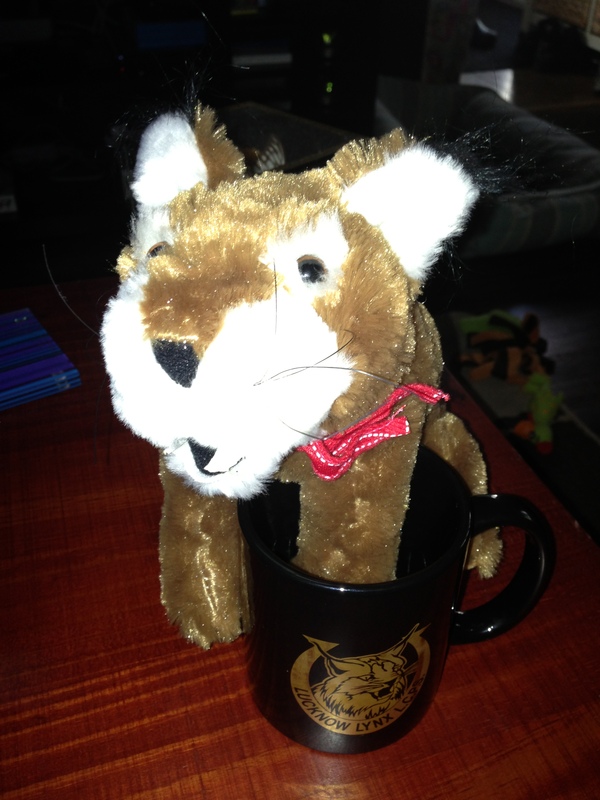 A cute stuffed lynx and an awesome mug!! It has been a while since you have posted something. I hope that all is well with you. I have enjoyed reading about what you have been doing for others in your community. Keep it up! You are really quite an incredible young lady. ¡Hola Penny tengo tiempo de seguirte y me ha gustado mucho saber lo que haces, el viajar 15 horas tan solo para dar tu tiempo a alguien habla bien de ti, nada hay mejor que vivir para servir, deseo que te sigas superando en grande porque grande es la tarea porque grande eres tu.